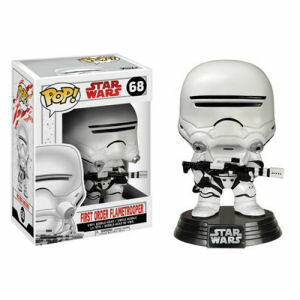 We have Just Sold out of Star Wars The Last Jedi First Order Flametrooper Pop! Vinyl Bobble Head #68. This Item is unavailable at present. From the Star Wars The Last Jedi Pop! Vinyl collection by Funko. Star Wars The Last Jedi First Order Flametrooper Pop! Vinyl Bobble Head #68. Measures 3.75 inches tall and comes with a decorative Star Wars stand. Funko Star Wars Pop! Vinyl shipping from Canada. No Surprise Border fees or Customs!